Home » Movie Reviews » “12 Years A Slave” – Another Masterpiece from McQueen with full of sensational performance! ‘There were nine remarkable movies nominated on Oscar this year, and only one of them should celebrate the victory. 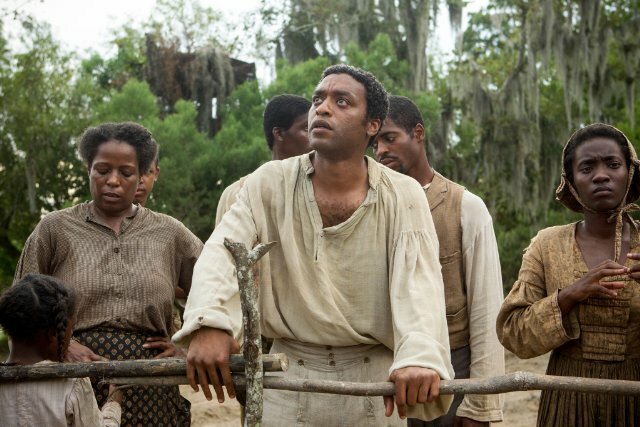 Since we already know that Steve McQueen’s “12 years a slave” is the one who has celebrated the victory this year, so that is why it gives me an excellent opportunity to look back at all nominated movies and analyze them. And hopefully, in the end, you will understand that only Steve McQueen’s movie deserves to be the best movie of the year! 1: “American Hustle” – directed by David O. Russel was my second favorite movie of the year. David O. Russel was able to gather quite talanted actors together to make his movie as good as possible. By seeing such incredebly gifted actresses like Amy Adams and Jennifer Lawrence in one movie makes you just run to the movie theater to watch whatever those actresses created on the blue screen by showing us how good they are. Bradley Cooper was also surprisingly well as Richie DiMaso. An Academy Award winner Christian Bale is well known not only as Batman, or as Dicky Eklund (The Fighter), he is the one who managed to dissapear in his character in the movie “The Machinist”. Don’t you believe me? Just watch it then. By looking at all movies where he appeared, you know that in “American Hustle” don’t expect anything else, but only masterpiece. And this is one of the main keys why “American Hustle” is a must-see movie. But there was a little detail, but a very important one that would not allow “American Hustle” to win is “12 Years a Slave”. 2. “Nebraska” directed by Alexander Payne tells the story of an old man(Bruce Dern) who receives a letter saying that “If his number in the winners list”, he need to go to Nebraska to claim his a million-dollar Mega Sweepstakes Marketing Prize. But, an old man ignored the word “IF”, and believes that he won a lottery. Nobody except his son (Will Forte as David Grant) is willing to believe him, or just to pretend that he does. Despite everything, David Grant will takes his father to Nebraska to claim or not his father’s prize. The movie itself is not trying to show us someone at his old age can win a million-dollar lottery, no,it is NOT. There was much more deeper meaning of making this movie: telling us how important is to not ignore or to be indifferent towards your parrents or their needs or problems,even though you can find them very stubborn. And why not? Even though,sometimes it is very hard to prove something to the elderly people, the movie teaches us how important is to be patient and calmwith your elderly parents. I would say, this is a must-see movie. But definately, not one of the best. 3. If you want to watch the movie about the bravery, courage, willingness to sacrifice the life for someone then “Captain Phillips” is the right choice for you. The film directed by Paul Gringras tells the story of an american cargo ship being hijacked by Somali pirates. And Captain Richard Phillips (two time Academy Award Winner Tom Hanks) faces against stubborn the Somali pirate captain, Muse and his crew. This movie is full of rollercoaster of emotions. Not to mention about Tom Hanks’s absolutely outstanding performance. It seems this movie deserves to get an Oscar. But hold on, you haven’t seen “12 Years A Slave” yet. 4. Imagine, you’re a brilliant engineer, but unexperienced astronaut. You’re getting once-in-a-lifetime opportunity to fly to Space with veteran astronaut. It sounds great, isn’t it? First shuttle mission, what can be better? Everything goes perfect for Dr Ryan Stone (Sandra Bullock) and Matt Kowalski (George Clooney) until the seemingly rountine spacewalk will turn out a nightmare for both astronauts. And whatever she had in her mind will swept away except one thing: “how to survive in a space?” Screeming, asking for help not going to help. Nobody except herself will hear her plea for help. “Gravity” directed by Alfonso Guaron will not leave you indifferent . It will make you move, scream, horrifying for every single try of Dr Ryan to survive in Space as if you would be there yourself. Most likely, 2013 will be associated with the “Gravity”. Sounds like, this is the movie we want to win. But I am sure, you might thinking so, just because you haven’t seen “12 years a slave”. his is tremendously sad story of a free-born Afro-American man who was kidnapped by slave traders, having been enticed to Washington, D.C. with a job offer as a traveller entertainer. After being drugged, Solomon found himself in a prison. Since slavery in Washington, D.C. was legal Solomon Northup could not find a way to escape from prison. And he ended up spending his 12 years in slavery, leaving behind his beautiful life, his beloved wife and kids. And imagine, Solomon was not the only who has spent his life in slavery.There were many, many others. It is really upset me knowing that there was a time when people cared more about the human skin color more than it`s personality. And the only thing discompose me is “I don`t see changes since 1851. You can try to remonstrate against my words, but I do really think so. The only thing holds all those people from do what they were allowed to do is a law, and a fear that some of them can get arrested. But I don`t want to go far, and discuss or prove something that historian could not do. The story of Solomon can easily dumbfound us, but it also can teach us many things such as: forgiveness, being kind to each other, to love each other, never giving up , and to hope and believe that there is still someone who still has a power to drive us out of darkness to light. That`s one of the main reason I believed and very also very pleased that “12 Years A Slave” won an Academy Award, giving new generation a chance to learn the lesson of the past and apply to the present.